In the presidential election of 2008 America seemed ready to elevate a woman to the presidency or vice presidency and—with Hillary Clinton and Sarah Palin—was on the verge of actually doing so. Words like inevitable and phenomenon were in the air and the political and cultural stars seemed to be aligned. Why didn’t it happen? What will it take to make it happen soon? Kornblut identifies the surprising realities of gender politics, such as the harsh treatment female candidates often receive from women voters, the gap between the United States and other countries when it comes to the electability of women, the “mommy penalty” that handicaps women candidates with young children, and the special appeal that women with law enforcement backgrounds have with voters. 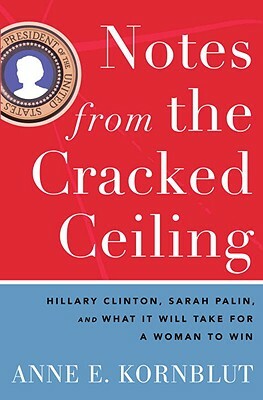 Notes from the Cracked Ceiling reveals that the highly touted new era of gender-equal politics never got as far as was commonly perceived and is now in full retreat. It is essential reading for anyone who cares about politics and the limits for women that persist. ANNE E. KORNBLUT has been a political reporter in Washington since 1998--covering, from start to finish, the three most recent presidential campaigns. She worked for the "Boston Globe "and the "New York Times" before joining the Washington Post in 2007 where she is currently a White House reporter.